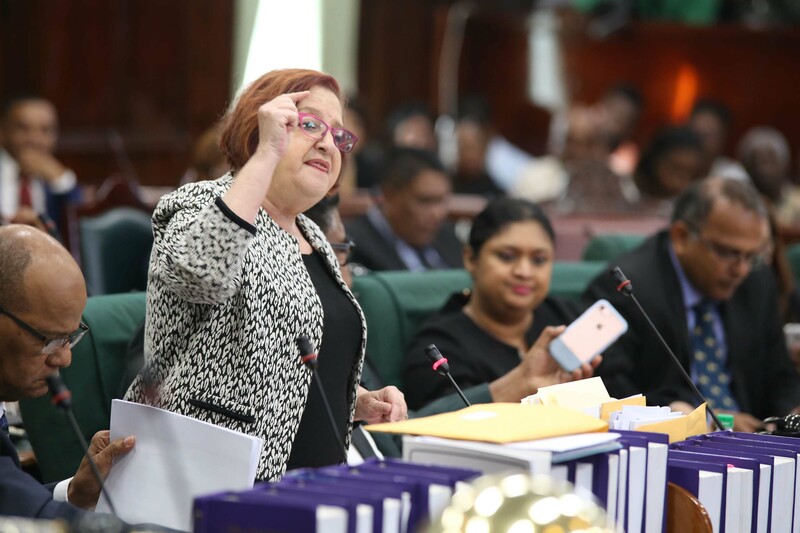 Friday’s debate of the opposition PPP/C’s no-confidence motion got off to an unimpressive start but by the half-way mark, had gained momentum when the government began blasting the former PPP/C administration for its failures while in office. Minister of Legal Affairs and Attorney General Basil Williams, SC, during his 30-minute presentation, spoke about the effects of the “dark period” under PPP rule. He singled out the actions of the Phantom Squad, the large number of young men from one ethnic group who were being taken before the courts on trumped-up charges, and the killing of women inclusive of one outside the PPP’s Freedom House headquarters. 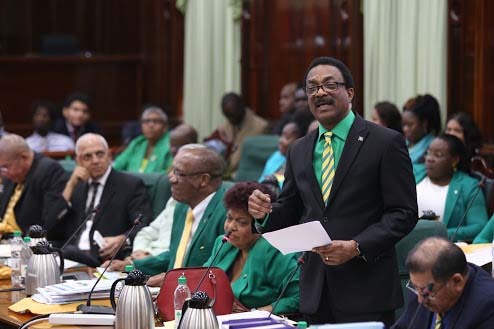 Williams, who was the second government speaker, said too that the government inherited a broken judiciary and the stalemate that exists with respect to the substantive appointment of the two top judicial officers. “We ain’t teking no blame for no acting Chancellor and no acting Chief Justice. We have to move ahead and govern the country the best way we can. 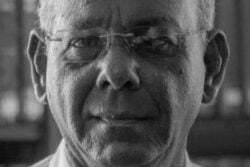 Granger is a great leader,” he said. 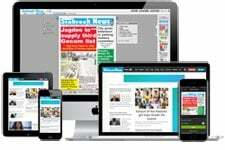 His predecessor Anil Nandlall, used his allotted time to declare himself underwhelmed by government’s attempt to defend themselves against the motion. “They have not defended their programmes. They have not defended their policies and I invite you to resign…don’t wait for the vote, do the dignified thing and resign…walk out the House,” he declared. “These people in the gallery came to hear government defend their record,” he reminded before turning to the coalition manifesto to bolster his argument. He stressed also that rather than confronting serious crime as promised, the coalition’s tenure has been marked by daily increases in the crime rate and the highest number of prison breaks in this part of the world. “We have to say it a million times, you have no policies that you can defend,” Nandlall said. Kicking off what later turned out to be a six-hour debate was Opposition Leader and mover of the motion, Bharrat Jagdeo. 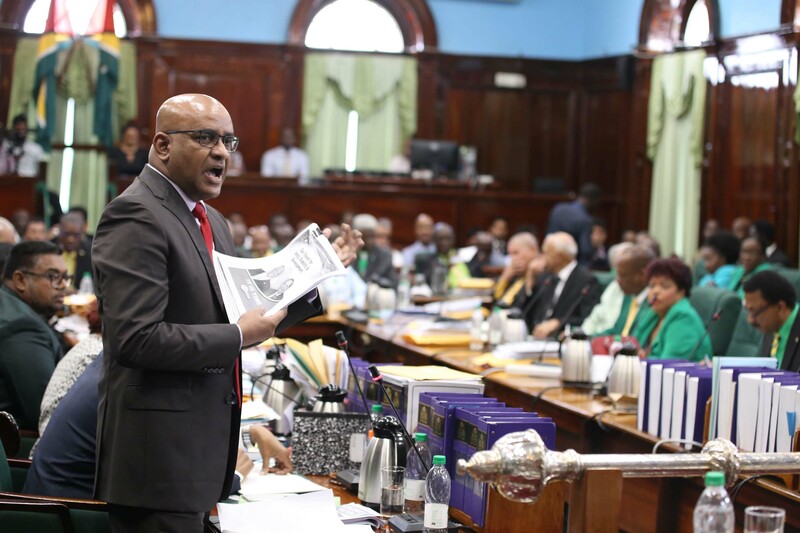 In the face of sustained heckling from the government benches, Jagdeo declared that he would prove that rather than working for the betterment of the people, government ministers were growing fat on the perks of office. “That’s why they would like this motion to disappear…they are very worried, look at their faces,” he told the House as the government MPs chanted “bring it on.” Jagdeo argued that government has mismanaged the resources of Guyana, has harmed the country’s democracy by engaging in unilateral action, and has proved itself untrustworthy by reneging on its manifesto promises. “All of their promises, they have failed to keep,” he charge, adding that after promising the elderly lower prices for utilities, the government instead attached Value Added Tax to the services and removed the subsidies granted to pensioners. 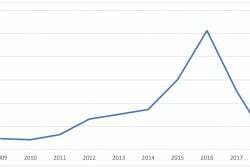 In fact, according to Jagdeo, though government promised to reduce VAT they have instead increased taxation by $88 billion per annum. “Government has increased extravagance by $31 billion (and) removed 32,000 jobs,” he argued. 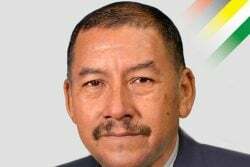 He said that the APNU+AFC government has not brought in a single major investment and is focusing on oil and gas when they did not bring ExxonMobil to Guyana. He said that even in dealing with this company, government has failed to properly represent Guyana resulting in a skewed agreement. “They talk about scandals. If I talk about their scandals I will run out of time. 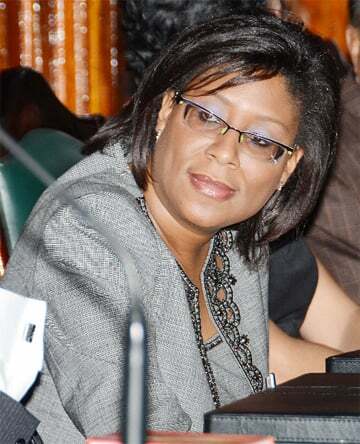 (Public Infrastructure Minister David) Patterson is before the police and (Minister of Public Health) Volda (Lawrence) is constantly before the procurement commission yet they talk about scandal. I can’t even list their scandals,” he declared. In closing off the debate moments before the vote was taken, Jagdeo responded to many of the claims made by the government speakers. On several occasions, Speaker Dr Barton Scotland tried to stop him but Jagdeo insisted that it was within his right to respond. Minister of State Joseph Harmon, who opened the debate for government, spoke after Jagdeo. He used most of his 25 minutes to remind all about the work government has done to develop the controversial D’Urban Park and how the former PPP/C government neglected the residents of Georgetown. 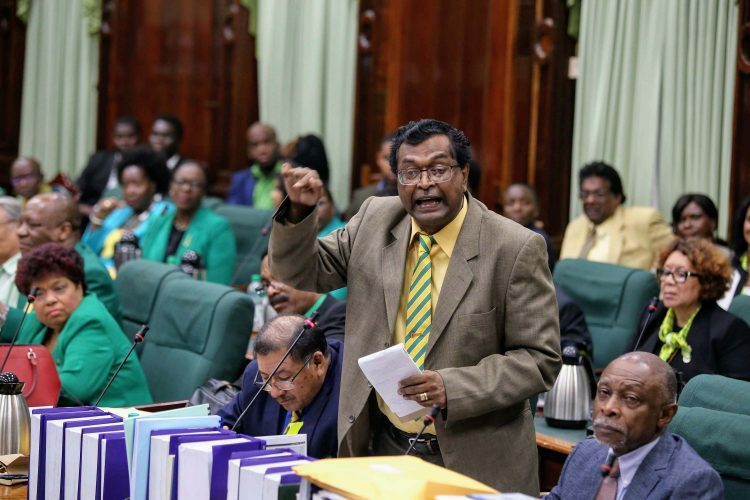 Dressed in a green jacket and white shirt, complemented by a yellow tie, he turned to the opposition benches and accused the PPP/C of denying citizens of Georgetown funding to develop spaces such as D’Urban Park, which he highlighted, was used to hold events such as the independence jubilee celebrations and a circus. “You have done nothing to this city for all those years,” he said, adding that the then PPP/C government never green-lighted or supported the decisions made by City Hall. “They are ashamed that in one year, we have been able to move from bush to a proper facility,” he said to shouts of support from his fellow MPs. According to Harmon, given all that the government has done since it took office, the public including those living in the city, have confidence in it. 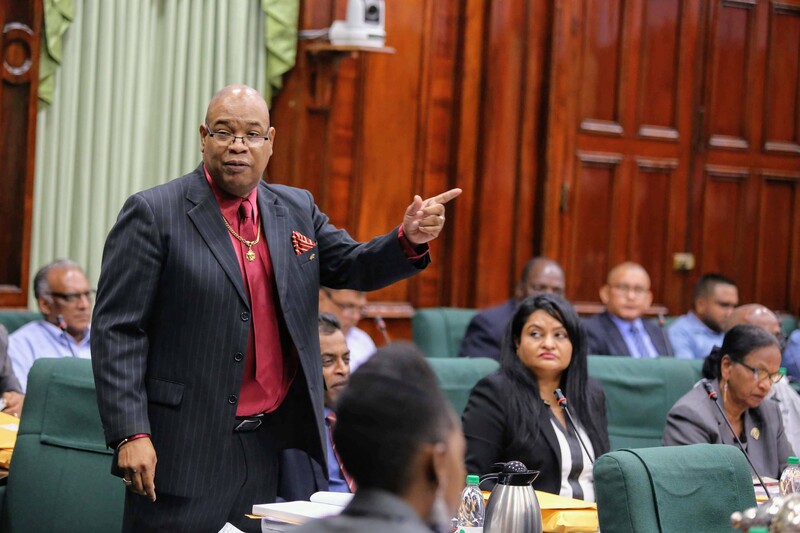 The House descended into chaos when Harmon said that Jagdeo “led this nation to believe that he had a legal marriage.” Speaker Scotland was unable to control the cacophony emanating from the two sides for more than a minute. The Speaker later reminded the MPs that while they were being given a great deal of latitude, they ought not to make personal remarks. “We are crossing the line”, he said to shouts of “No! No!” from the government benches. He informed the members that he was telling them what was required and was not seeking opinions. “How dare you Mr No-marriage?” Harmon declared, despite the Speaker’s warning. The Speaker, in response, again reminded that that was not the subject of discussion. Harmon in defending himself, said he was just trying to describe what the coalition government found on the first day in office, “the shame” that citizens had to endure under the PPP/C government. “Our administration ushered in a spiritual and moral revival” led by the president with a “real marriage over 48 years,” and the Prime Minister, a devoted family man with a “real marriage of several years with his wife Sita,” Harmon added. Next to speak was Opposition Chief Whip Gail Teixeira who invoked the results of the November 12 local government elections. “Local Government was a referendum….governments rely on the support of the people and this government lost that support on November 12. This motion was filed after it was clear that government had lost its mandate,” she asserted. For Teixeira, the government’s mandate was intrinsically tied to the 4,500 more votes the coalition earned in 2015 which she argued was half the 7,000 votes which represent a seat in the House. “In 2016, you didn’t do well and in 2018, you were slaughtered. We have the mandate of the people. They gave it to us on November 12,” she added. Minister within the Ministry of Natural Resources Simona Broomes, during a fiery contribution to the debate, invited the opposition to join forces with the government for the betterment of the country. “You have a long time in opposition so it’s best that we work together. I invite the opposition to join us. There are not enough seats over here but come, we will accommodate you…Let’s join hands and work together,” she said. While stressing that government has been working in every area, cleaning up the mess left behind, she urged the opposition not to get frustrated. She said that the motion that is being debated is not even worth a vote. “I think at this time you should withdraw…this is the festive season,” she said. 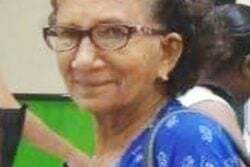 Dressed in a green jacket, Broomes reminded the House of all the sufferings she and her fellow Barticans endured under PPP rule. Aside from continuous promises of township status, she said that the community faced constant blackouts. She said that at Christmas time, residents were without lights while lack of water and poor healthcare were among other problems that residents faced. 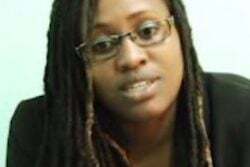 She spoke of pregnant women having to be rushed to Parika in a speed boat to seek medical attention at one o clock in the morning. 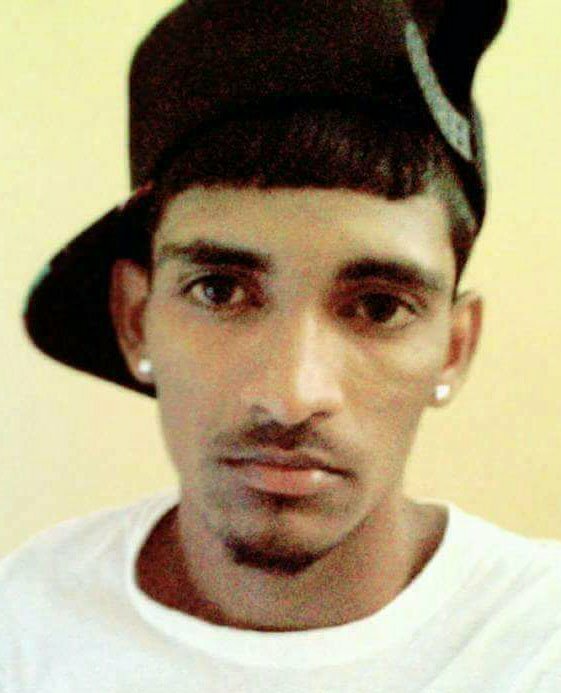 PPP front bencher Irfaan Ali who spoke after Broomes, contended that government has significantly increased its borrowing from the local banking sector and is therefore competing with the private sector for scarce resources and is driving up rates. He repeated some of the arguments laid out in his budget debate presentation. In a lively presentation on the PPP’s no-confidence motion, Public Security Minister Khemraj Ramjattan said that government, since taking office, has done a lot to tackle the crime situation. 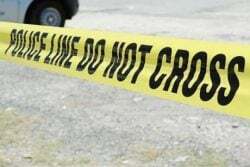 While denying that he and government had a hand in the charging of two opposition members, he said that under this administration, a US Drug Enforcement Administration office was set up here, a British specialist came to assist in the area of security reform, the 911 emergency line is up and running, the country has improved in its Trafficking in Persons (TIP) standing and the piracy ring has been smashed. 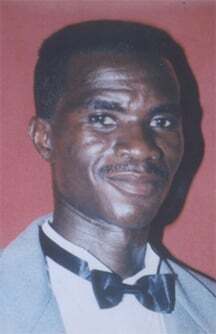 As Juan Edghill, the last PPP/C MP spoke, those in the government began singing a refrain of the hymn “Let my people go.” Ignoring the attempt to distract him, he said that the government has failed to mobilise people at the local government elections and in front of parliament during the budget debates. 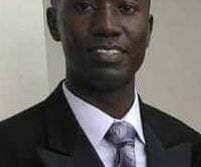 He said that while D’Urban Park was the signal achievement, it is one of the most corrupt contracts under this government as $500 million is still unaccounted for. 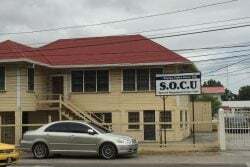 He mentioned the Sussex Street bond and the various procurement issues marring the Ministry of Public Health and argued that government supporters have lost all faith in the government. The government later dramatically lost the vote after MP Charrandas Persaud voted with the PPP/C. The result means the general elections will have to be held within 90 days.